Limited edition of 50 pieces. 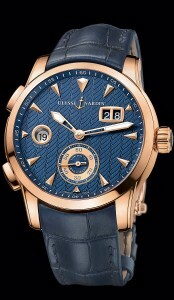 It is a rose gold, 42mm case, big date, GMT Dual Tlme, with Ulysse Nardin all in-house automatic movement. It features a glass back exhibition case, the visible rotor is etched with the Ulysse Nardin name and anchor logo. Available on elegant alligator strap and folding rose gold buckle.